Description of a ski tour through the Austrian Hoch Tirol in the Eastern Alps taking in the Gross Geiger, Granatspitze, Gross Venediger and the Gross Glockner. 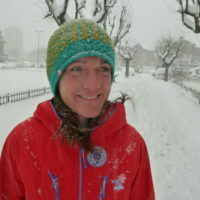 Tania Noakes is a professional mountain guide based in Chamonix. In this article she recalls a ski tour through the Austrian Hoch Tirol, a high glacier journey taking in the Gross Geiger (3360m), Granatspitze (3086m) and the Gross Venediger (3674m). 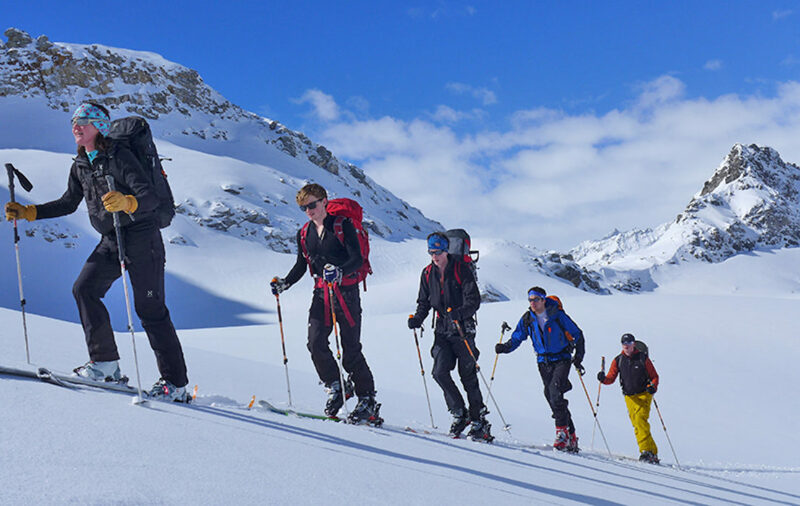 This isn’t a ski tour for novices. The journey is both long and demanding – many of the days entail altitude gains of 1000 to 2000m – but don’t be intimidated, because this also means a great deal of quality skiing and the opportunity to summit a 3000m peak every day. These days are eased by staying at very welcoming huts, which offer great local food and wine. Quite a few of them even have hot showers or saunas to reinvigorate tired legs in time for the next day. Every once in a while life deals you an unexpectedly good hand. Reflecting on my recent ski tour through the Hoch Tirol in Austria makes me light up inside. I can’t help but smile as those memories hold me. Sometimes the right combination of people and circumstance in the mountains create a magical and memorable adventure. Over the last 10 years these special shared moments have come more and more often. You could say that I’m lucky… but it certainly helps if you pick the right adventure. This one is definitely worth sharing. The ‘Hoch Tirol‘ is a magnificent journey through the Eastern Alps. It follows a logical route through some very beautiful mountain terrain and includes several unforgettable ski descents. It’s a glacial tour traversing some of the highest peaks in Austria, including the Gross Geiger (3360m), Granatspitze (3086m) and the Gross Venediger (3674m). The area is quieter than the western Alps and as you wind your way through the valleys of the South Tirol, Salzburger and Carinzia provinces you get a real sense of being in a mountain wilderness on your own terms. After 140km the traverse brings you to the slopes of the Grossglockner, Austria’s highest summit at 3798m. This is not only a very beautiful mountain but one which, for a suitably experienced team, makes a fitting finale to the best ski tour the Eastern Alps has to offer. This is quite a long first day involving two sections of ascent and descent. You follow an old smugglers’ trail over two high cols before being rewarded with a beautiful descent to the first mountain hut. It’s a good idea to get an early start. This not only means you can take things more steadily on your first day, but also that you get good snow conditions on the ski down from the second col. This year the weather forecast as we set off for our tour was not terrible, but certainly not ideal. We started climbing under a grey sky with strong winds high up and the cloud level not too far away. With a strong group and good banter optimism buoyed us up into the clouds. As we climbed the last metres to the first col the clouds were swirling thinly about us, the sun straining to break through. A few steeper turns on the far side and the wind broke a clearing in the clouds to give us our first glimpse of the Umbaltal and the Reggentorl on the distant skyline. Now in bigger turns, wider, smoother, the trail looked ahead to the wide tongue of the Umbalkees glacier. Six smiling faces regrouped under a clearing sky, refreshed and ready for the second climb. Up ahead on the smooth, featureless ice was once the wreck of a Junkers 52 aircraft forced to make an emergency landing during WW2. For many years the wreck was used as reference point and picnic spot: nowadays there is no sign of it, as in 2002 the wreck was removed, the cockpit restored and put on display in a museum in Prägraten. You can see it if you base yourself in Prägraten before you start the tour. During its 60 years in the ice it moved about 500m down the flow of the glacier. The ascent to the Reggentorl is gradual and without serious crevasse danger. The descent on the far side to the hut is steeper and across a smaller but more broken glacier, so it is important to pick a safe line. This day takes in the first big summit of the traverse, the Gross Geiger (3360m). It can be gained on skis, but the final section is steep, exposed and sometimes icy so have your ski crampons handy. It is also possible to climb the last part on foot. The first hour or so from the hut along the almost flat valley floor of the Stredacher Winkle is easy enough and we made good progress in the early morning light, although accompanied by a bitterly cold wind. The valley kicks back after a while and you begin the real ascent to the Gross Geiger. We were glad of the extra effort and the sunshine to help keep warm. From the summit you gain your first glimpse of the ice giants traversed further east, later in the tour. Although this day is a little shorter than the first it is a key passage through to the Johannis hut and finds an unexpected line high along the flank of a spectacular mountain ridge through to the next valley. The final stretch of this flanking traverse at the Türmljoch grants access to the Dorfertal and two possible descents to the next hut. In stable snow conditions it also allows an immensely enjoyable steep ski descent of the ‘Cannon’, directly to the hut. The Johannis hut itself is one of the oldest mountain huts in the Eastern Alps, first established in 1857 – although it has been renovated several times since! 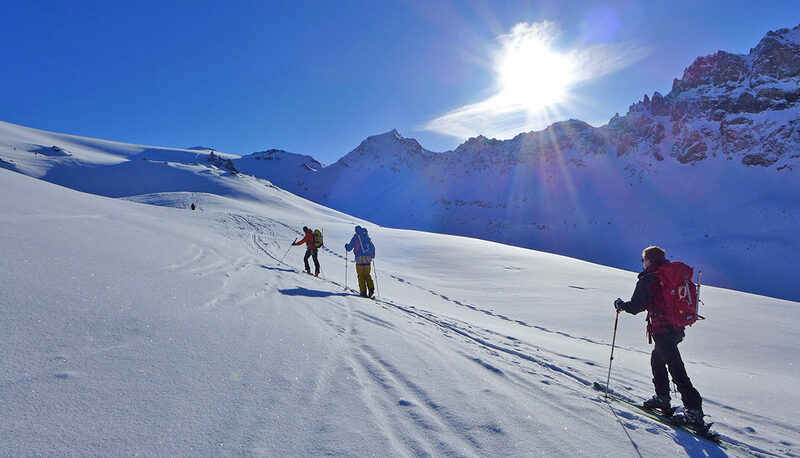 It is an important ski-touring base in its own right and an additional day based here offers many day touring options to complement your journey. This key stage of the Hoch Tirol traverse is both strenuous and rewarding, taking you through some majestic scenery to an impressive summit followed by 2000m of north-facing descent. The glaciers of the Gross Venediger (or ‘Big Venetian’) are quite crevassed and good visibility is important to negotiate some sections safely. The summit itself is the fourth highest in Austria and from the top you can see all the peaks of the traverse in one stunning panorama. This day is undoubtedly one of the highlights of the tour and includes a descent that could easily be the best of your entire winter. It was certainly one of ours, steep powder snow and then more mellow spring snow with no cruddy transition. As you gain the flatter floor of the remote Innerschloß valley, on tired legs, take time to enjoy what is considered by many to be one of the most beautiful valleys of the Eastern Alps. Meanwhile if you can conserve energy and remember good skating technique then this might not be a bad thing. If all this doesn’t inspire you then the Matreier Tauernhaus, your end point of the day, certainly should: it more than deserves its’ reputation for hospitality and even has a sauna… our group all agreed that this is ski touring at its very best! This stage takes you through some challenging terrain before delivering you to the Rudolphshutte, a three star high mountain hotel with small ski area. It is also the longest day of the journey, with 2000m of altitude gain (remember you descended a lot yesterday!) which is climbed in two very agreeable sections. You may be surprised to find that it doesn’t feel much harder than the previous days: perhaps a result of the sauna the night before? Both ascents are varied and in beautiful surroundings, and the descents find slopes at a great angle for skiing, often holding good snow. From the high point of the day, the Stubacher Sonnblick, the hut is clearly visible and you can relax knowing that civilisation really isn’t too far away. It wasn’t always quite like this, however. In 1943 this area hosted Camp Weißsee, one of Dachau concentration camp’s official auxiliary labour camps during WW2. Three wooden huts housed 450 prisoners of different nationalities who formed a slave labour force used for quarrying and building a gallery for the reservoir. The sub-zero temperatures, inadequate rations and dangerous nature of the work saw many fatalities. Those who tried to escape had a harsh mountain wilderness to survive, even if the SS guards missed the targets painted on their uniforms. The Weißsee camp was officially liberated in May 1945 by American GIs. The Rudolfshuette is now more welcoming to its guests, and the self-service buffet is thoroughly recommended. This year we suffered some undeniably bad weather here, snowfall combined with poor visibility and strong winds. Waking up in the comfort of a three star hotel at 2300m doesn’t warm you to the idea of battling through a gale in the high mountains. So we made a clear decision to renounce the Granatspitze’s summit and take the more secure passage into the Dorfertal over the Kalser Törl, or Kalser Tauern pass (2518m). Given good conditions the climb back up to the Granatspitze passes surprisingly quickly. 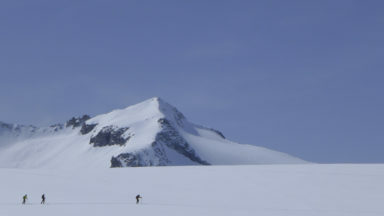 A ski cache can be made at the base of the east ridge for an ascent of the final ridge. This is the first technical climbing of the tour and does require protecting with a rope and some basic climbing skills. Whether you opt for the summit or not, another excellent descent awaits, first steeply down the south wall of the Granatspitze itself. The angle soon eases and launches you onto more moderate but equally enjoyable slopes to the bottom of the Dorfertal valley, which valley narrowly escaped being submerged by a reservoir when population of the Kals valley mounted a successful campaign against a power plant construction project here in the 1970s. It’s worth reflecting on the pressure we exert on our mountain wilderness as you weave a line along the valley sides. It is a steep sided valley, susceptible to avalanches from above: you might, sensibly, try to keep your height to avoid skating, debris from previous avalanches and steps in the valley floor which combine to reduce your options. This is a long and scenic ski which for the most part demands little effort. Towards the final section you are forced into a narrow gorge, the Daberklamm. The name has a double meaning: ‘Daber’ and ‘Klamm’ both mean ‘gorge’, in both German and the regional dialect. It is quite an impressive feature, so perhaps the locals just wanted to emphasise the point. The best route follows a snowed-up road along the canyon wall. The half-frozen river lies steeply down to your right and encourages you to ski in control. Finally you arrive at a rock wall, where a tunnel grants exit from the gorge. Skis off and a short walk through darkness (or get out your head torch) sees you safely to sunlight on the far side. This sudden opening out into alpine pastures removed any sense of disappointment from our group at having to take the ‘easy’ option, everyone buzzing with a sense of excitement and achievement as we cruised along the last few metres, reaching the Gasthof Taurer in Taurerwirt (1521m). We were almost there, a challenging and satisfying journey behind us and the Queen of the Eastern Alps ahead. It’s best to pre-arrange a taxi to take you the short drive round to the Lucknerhaus, where the ascent of the Gross Glockner starts. A quick pit-stop for a fortifying coffee (and cake) is also recommended before setting a steady pace for the final climb up to the Studlhutte and your bed for the night. This year strong winds and bad weather meant that we stopped for a couple of nights at the Lucknerhaus, which comes highly recommended as a place to finish a tour. If you plan to climb the Gross Glockner the next day this means a very early start. After the previous five days you will be fit and acclimatised for this final day. 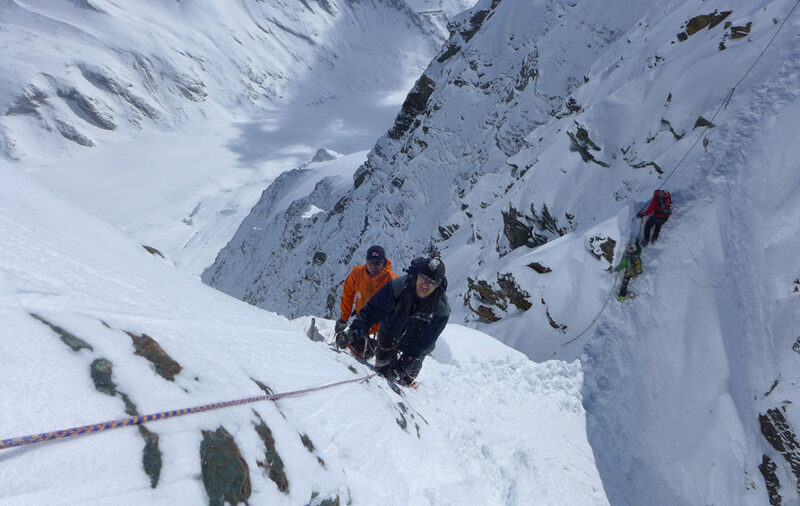 The ascent of the highest peak in Austria is demanding because of the technical nature of the summit ridge, which involves exposed mixed climbing at grade II. If you are in any doubt of your ability to protect this section either leave it out or go with a qualified Mountain Guide. If you start at the Studlhutte then the day is not overly long. You can start from the Lucknerhaus, but only with a fit team and a very early start. This year’s weather conditions meant that we had to opt for the very early start. A good 30cm of fresh snow had been put down overnight at the Lucknerhaus and it was still snowing when we set off. We had to hold faith in the forecasts that were adamant it would clear. Starting a ski tour in the dark adds an extra sense of excitement to the day. You can be totally focused on what you are planning to do, wrapped in a bubble of light from your head torch but at the same time lost in your own thoughts. The light snow and thin cloud only added to the atmosphere. 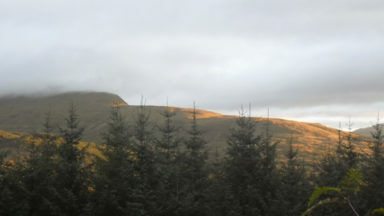 Within an hour we had ascended out of the cloud and were working hard uphill under a gradually brightening morning sky. Our team made good time, tracking in the new snow. Forced to take a different line further west due to the heightened avalanche risk we were alone and ahead of the teams leaving the Studlhutte at first light. The best line up the Kodnitzkees glacier varies with the conditions. 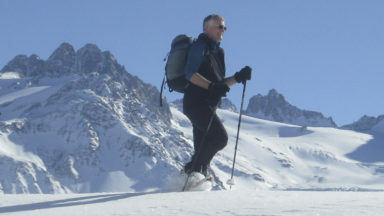 In stable snow it is possible to continue, steeply, all the way to the Glocknerleitl at the head of the glacier but this requires good kick-turns and often ski crampons. With new snow about it was an easy choice for us to head over to the normal summer ascent route, which climbs the ridge that drops south from the Erzherzog Johann Hut, involving some scrambling protected by wire cables. We took our skis with us, but other teams made a ski cache at the base of this ridge. From the Erzherzog Johann hut you can put your skis on again and continue to the final rocky section below the Kleinglockner. Tracking through the new snow to such a fine summit gave me time to reflect on a week of great company and some very satisfying ski touring. This final day, climbing along the exposed final ridge under a perfect blue sky and in fine alpine conditions, was a memorable experience. The amazing views, the easy company, the challenge, and the fantastic powder snow… it’s impossible to do it justice in such a short article. After some quick summit photos and high fives all round we retraced our steps, past several other teams on their way up on this glorious day, to our skis not far below. How good a skier should I be? The route is suitable for intermediate to advanced off-piste skiers. The ascents are relatively long, a rucksack must be carried, and some descents may have to be skied on tired legs. There are moderate sections of steeper skiing, including short sections of 30° or more which must be negotiated in control. You should be able to do a reasonably competent ‘uphill’ kick turn on moderately steep slopes. This is a physically demanding tour both in terms of daily ascent and the accumulated mileage over the six days. 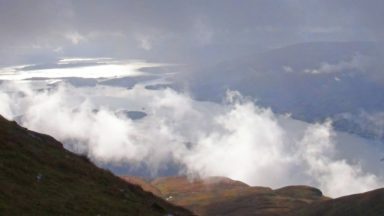 Most days involve altitude gains of 1000–1500m with one day requiring 2000m of ascent. You should be able to skin uphill at a steady pace of 400m per hour. You should be reasonably organised with your personal ski-touring equipment. How technically demanding is it? In terms of mountaineering skills it is not a technically demanding tour. It traverses large glaciers, including areas which are notoriously crevassed. Because of this it is essential you have the necessary skills for safe glacier travel or go with a Mountain Guide. 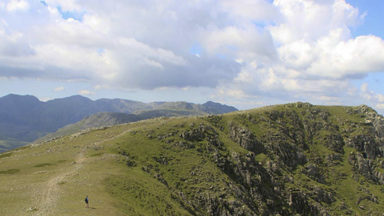 Most of the peaks can be ascended on ski or relatively easily on foot. 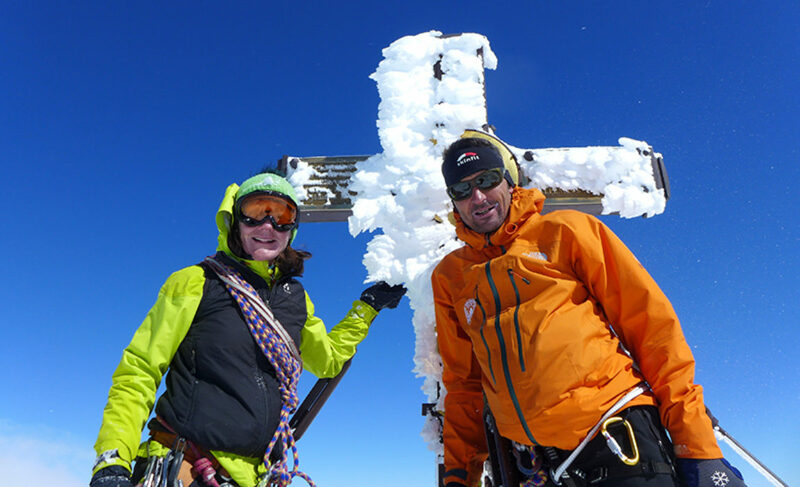 The Granatspitze and Grossglockner require mountaineering skills, judgement and appropriate technical equipment. Some basic climbing experience would be beneficial if planning on climbing these excellent summits even in a guided group. AV Map 35/3 Zillertal Alp 1:25,000; AV Map 36 Venedigergruppe 1:25,000; AV Map 39 Granatspitzgruppe 1:25,000; AV Map 40 Grossglocknergruppe 1:25,000. The Maps are also available in electronic format for compatible GPS devices. The nearest airport is Innsbruck where car hire is easily available. 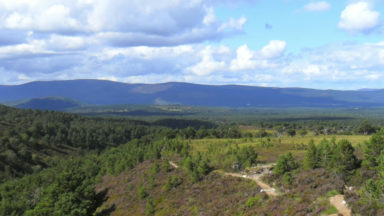 Alternatively with more time you can use bus and train connections to get you to and from the tour. It is advisable to have a ‘warm-up’ day piste skiing including a short tour before you set off. From Innsbruck you have lots of options for piste skiing not far from the city itself. We chose to do our warm up days at Hochzillertal/Hochfugen but many Austrian resorts are just as good. The tour itself can be started from north or south of the E–W mountain chain. We started ours from Val Aurina (Arhntal) in South Tirol. This is considered the classic start but you could start from the Zell-am-Ziller valley in the north or, for simpler logistics, from Prägraten in the Virgental to the south. The Val Aurina is now part of Italy but before WW2 it was Austrian and retains much of its Austrian feel. In winter the road ends at the small village of Kasern where there are some guest houses and a car park where you can leave your vehicle. If you do decide to leave a vehicle in Kasern count on half a day on public transport to get you back to it after the tour (taxi Lucknerhaus–Kals, Bus Kals–Lienz, Train Lienz–Brunico/Bruneck, Bus Brunico–Kasern). Enjoyable and also part of the adventure!